If you’ve experienced a drop in your retirement account values of the past 2-3 years, you’re not alone. Unfortunately, millions of Americans weren’t adequately prepared for the events of 2008, and many saw losses to their retirement accounts in excess of 30-35%, representing billions of dollars nationwide. As shown in Figure 2, there is a nonlinear relationship between losses and the required subsequent gain needed to recover from the loss. The term “nonlinear” simply means that as the loss gets bigger, the gain needed to restore the loss increases at an increasing rate. 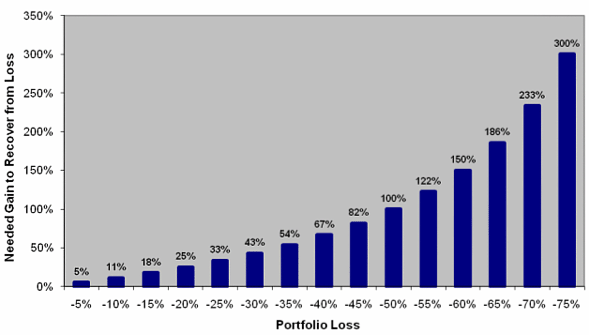 For example, a loss of 35% requires a 54% gain to restore the portfolio to whole. That said, how long might it take the S&P 500 to generate a 54% gain? Obviously, no one knows that answer, but let’s just look at the past four decades for an indicator. From 1970 through 2010, the S&P 500 Index never had a one-year return in excess of 54%.1 Thus, while you can lose 35% in a year’s time, the likelihood of making up that loss in an equivalent time frame is slim to none. 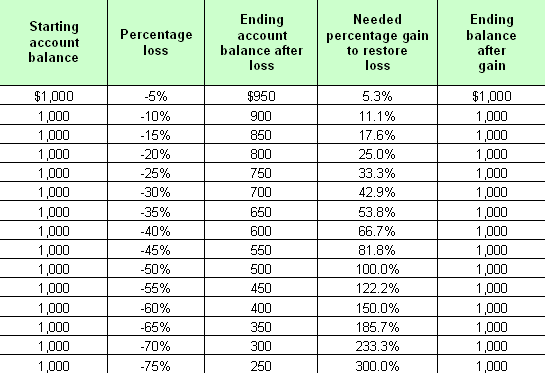 Smaller losses, such as a 20% loss, may be more quickly resolved. The S&P 500 Index generated a single-year gain of 25% or more (25% being the minimum gain needed to restore a portfolio following a loss of 20%) in 10 separate years between 1970 and 2009. 1More serious losses require longer recovery time frames, if recovery is even possible at all given your specific retirement horizon. This brings us back to what many consider Rule #1 of Investing: Avoid losses wherever possible. Whether you’re looking for continued conservative accumulation for retirement or you’re ready to convert the savings you’ve built into income you can rely on, the quickest way to derail your strategy is to incur losses from which you can’t recover. 1 www.finance.yahoo.com. May 2, 2011. The National Retirement Risk Index (NRRI) measures the percentage of working-age households that are at risk of being unable to maintain their pre-retirement standard of living in retirement. It addresses one of the most compelling challenges facing the nation today: ensuring retirement security for an aging population. Significant advances in medicine and technology have created an “age wave” in the United States in which people are living far longer than ever before. That trend is expected to continue, and many scientists now point to a time in the not-so-distant future in which people might be living an average of 95, 100 or even 110 years. While longevity continues to increase, the prevalence of traditional retirement income sources such as defined benefit and pension plans continues to decrease. The net result? A much higher responsibility on you – the individual – to have a sound plan in place to ensure that your accumulated retirement savings lasts as long as you do. • The retirement landscape is shifting dramatically, making the outlook for retiring Baby Boomers and Generation Xers far less optimistic than for current retirees. • Explicitly including health care in the Index drives up the share of households “at risk” to 61 percent. • Incorporating long-term care costs further increases the Index to 65 percent. • Saving more and working longer may be required to improve the outlook. We don’t feel the ups and downs of the market or today’s volatile economy should have ANY bearing or impact on your lifestyle and income in retirement. That’s why, along with a number of solutions built for accumulation of retirement assets, we also provide guaranteed retirement income solutions. These solutions not only provide income you cannot outlive, but many of the options available give you the opportunity for annual increases in income to help offset the effects of inflation. They also offer liquidity – or penalty-free access – to portions of your money should you need it for emergencies. If you haven’t secured your retirement income plan or you haven’t had it reviewed to ensure it will withstand today’s uncertain environment, you owe it to yourself to schedule a consultation with a qualified retirement income specialist. You’ve worked far too hard getting to retirement – don’t let financial worries make you settle for less than you deserve. Respond and learn how annuities can be used in various planning strategies for retirement. Guarantees provided by annuities are subject to the financial strength of the issuing insurance company; not guaranteed by any bank or the FDIC. * National Retirement Risk Index. Center for Retirement Research at Boston College. October 2010. Quick question: When is the last time your financial professional sat down with you to review your beneficiary designations? If it’s been ANY longer than 12 months, quite frankly, you should be concerned. Why? Because circumstances have a mysterious way of changing, and failing to maintain current, accurate beneficiary designations can be one of the most costly financial mistakes you could ever make. One of the most poignant examples of this mistake comes from an article in the New York Post. The story tells a twisted tail of Anne Friedman’s nearly million-dollar pension. Anne was a lifelong New York City school system employee. In 1974, Anne named her mother, uncle and sister on her beneficiary form with the Teachers’ Retirement System. A year later, Anne met and married Bruce Friedman to whom she was happily married for the next two decades. The moral of the story? Keeping your beneficiary designations current – especially after a life-changing event such as marriage, divorce or the birth of a child – is absolutely critical. Here are just few additional examples of common situations that could create very undesirable outcomes. Roger & Leslie divorced after nearly 15 years of marriage. Both eventually remarried, but Roger failed to update his designations and replace Leslie with his new bride. At his untimely passing, Leslie received over $400K from his IRA and roughly $300K in proceeds from a life insurance policy that still had her named as the sole beneficiary. Walter was a 62-year old doting grandfather. When he last reviewed his accounts nearly 8 years ago, he had two grandchildren. He named these boys the beneficiaries of an IRA he’d always earmarked for his grandkids. Walter’s daughter later had twin girls, but because he failed to ever review his designations, they were never updated, and the twins never received an equal share of his account as inheritance. Veronica and Jim had been married for over 25 years. Childless, they had each designated each other as the sole beneficiaries of each other’s retirement accounts and small life insurance contracts. Jim predeceased Veronica, but her designations were never updated, and at her passing, over $800K became part of her taxable estate rather than passing on to a secondary beneficiary. Each of these is an outcome that could’ve easily been avoided with a simple, annual review of the individuals’ beneficiary designations, and if you haven’t sat down to review yours in the last year, the time is now. To schedule a complimentary Beneficiary Designation Review, simply call us at (704) 553-0123 or visit us at www.ChrisHobart.com today! These are hypothetical examples and are for informational purposes only. 1 “Pension Pickle.” New York Post. January 31, 2005. Whether you’re a Republican, Democrat, or non-affiliated, it’s always interesting when the President of the United States weighs in, endorsing a particular financial product or strategy. Most Presidents, and many politicians in general, steer a country mile clear of such backing, but in his most recent State of the Union address, President Obama made a bold statement in support of one of the most effective financial solutions for generating retirement income – the traditional annuity. CLICK HERE to view the full-length State of the Union video (the President’s quote can be seen at the 46-minute mark). The Obama administration will also be promoting the use of annuities to generate retirement income in upcoming proposals for helping stressed middle-income families. The administration’s plans include a proposal to encourage the use of annuities and similar products to transform savings into guaranteed future income, thereby reducing the chance of retirees’ outliving their savings or seeing nest eggs worn down by inflation or investment losses. These proposals were outlined in a fact sheet released by the White House just prior to President Obama’s State of the Union address. The American Council of Life Insurers, Washington, has released a statement praising the administration’s plans and saying it is looking forward to working with President Obama and his administration on advancing the retirement security proposals. So why exactly is the President of the United States so fond of annuities for retirees? Because he knows annuities are a product that can guarantee them a consistent retirement income. * With the future of Social Security more uncertain than ever before and guaranteed pensions and defined benefit plans becoming virtually obsolete, the reassurance offered by traditional annuities has become increasingly attractive. Now, please note: The fact that annuities offer guarantees does not make them the proverbial “silver bullet” for every individual’s situation. Beware of anyone telling you that any financial product is the “magic pill” for whatever ails you. However, the guaranteed income generated by fixed and fixed index annuities does make them a very suitable component for those who share one of the most common concerns of today’s retirees – the possibility of outliving their money. So what’s the likelihood you’ll outlive your assets? Why spend another minute wondering? Retirement is supposed to be the culmination of all you’ve worked so hard for – not some doomsday you’ve fretted about all these years. Let us help ensure you’re on path to the retirement of your dreams! CLICK HERE to see how OUR state ranks in the Retirement Vulnerability Index! *Guarantees subject to the financial strength and claims paying ability of the issuing company. 1ACLI Lauds Administration For Plans To Help Americans Secure Their Retirements. February 2010.